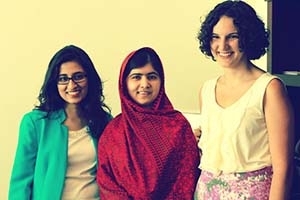 Like many people across the world, Olivia Curl (BA/SIS '14) and Lena Shareef (BA/SOC '11), were inspired by Malala Yousafazi when the fifteen-year-old Pakistani education activist was shot in 2012. Unlike most, Curl and Shareef took personal action that inspired others; they posted pictures of themselves on social media holding a book to show solidarity with Malala and every girl fighting for education, and encouraged their friends to do the same. The call spread far beyond their own networks, and they soon started receiving photos from all over the world. Since then, with a lot of hard work and a successful Kickstarter campaign, GIRLWITHABOOK Movement has become a non-profit media organization that advocates for girls' education and gender equality. This past year, GIRLWITHABOOK's team traveled through Kyrgyzstan, Pakistan, India, and Nepal to produce a documentary series on girls' education in South and Central Asia.